All hail Murderbot! So glad to be back for another round of action and adventure with our favorite SecUnit. I am unequivocally loving these novellas, and it still amazes me how much punch Martha Wells has managed to pack into each slim volume. Artificial Condition is the sequel to All Systems Red, so keep in mind this review may contain spoilers for the first book if you haven’t started the series yet (plus, if you’re still not on the Murderbot Diaries train, you’re really missing out). Following Murderbot’s leave-taking from its former team of human allies, our protagonist now has a precarious kind of freedom to decide where to take the next step. But with so much of its past shrouded in mystery, Murderbot is resolved to fill in the missing details in its memory bank first, especially given its violent history. There are so many questions still left to answer, such as how Murderbot went rogue in the first place, an event that resulted in a killing spree and the deaths of many humans. Was it Murderbot who hacked and disabled its own governor module, causing the rampage? Or was someone else responsible for those directives? To find out, Murderbot must first uncover where the massacre took place, and to do so it will need to pass itself off as human in order to travel freely. Just its luck though, Murderbot gets stuck on a transport whose AI sees right through its cover story and disguise. But instead of alerting the authorities, the AI transport, called ART, decides to help Murderbot learn the truth. Together, the two of them narrow their destination down to a mining planet. ART proceeds to help Murderbot with augments and alterations so that it can pose as a human bodyguard and join a research team down to the planet’s facilities, where Murderbot will hopefully find the data it needs. I always like to say that it’s the characters that bring a book to life and make me feel a connection, and this is especially true of the Murderbot Diaries. Murderbot is a part-organic and part-synthetic android, but its personality, as it were, is also decidedly unlike that of any robot I’ve ever had the pleasure of reading about. Murderbot is still constrained by a lot of its original programming, so its voice could not really be considered human by any stretch of the imagination. And yet, it still displays a lot human-like qualities I find endearing, not least of all its love for the campy entertainment feeds. Considering how Murderbot doesn’t even like humans all that much, it’s amusing how fascinated it is by the lives of the ones in its favorite soap operas. Even better is how Murderbot picks up so much of what it knows about human social cues from the fictional characters in shows with names like Worldhoppers and Rose and Fall of Sanctuary Moon—hiliarious! Artificial Condition also stands out because of the very special relationship between Murderbot and ART. While the humans come into play later in the story, I loved how for the most part this book was all about the two AI. Is this the beginning of a beautiful new friendship? I sure hope so, even if the two of them didn’t exactly get off on the right foot. It was interesting to see how their programming differed, one being a SecUnit with the other being a powerful, albeit often lonely, onboard computer on a long-haul transport ship. Somewhat to my surprise, it was ART who was savvier to the social ways of humans, teaching Murderbot how to blend in (and also pointing out everything Murderbot has been doing wrong, much to our protagonist’s chagrin). This introduction to ART opens up the world a little bit, as we’ve been led to believe thus far that Murderbot is something of an anomaly among AI. With ART, however, we now know there may be other bots floating around that do not always perform in accordance to their programming, which begs the question: what other possibilities are out there? I, for one, am looking forward to finding out. 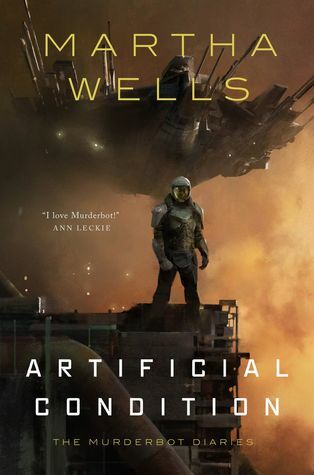 With each book in The Murderbot Diaries, Martha Wells continues to expand and explore the personality of her protagonist, putting Murderbot in new situations where it must learn and adapt. Despite being somewhat prickly and a little awkward, Murderbot is charming in its own way, and I just love reading these adventures through the eyes of such a compelling character. I just can’t wait to find out more as Murderbot carries on its investigation to dig up its past and find out more about its identity. I’m in the middle of this one right now and I’m loving the introduction of ART. To see these two interact in the early going with no humans around is pretty awesome. And I love the idea of there being other AI’s out there that are also bucking their programming/ are secretly free- the possibilities there are so amazing. Indeed! I’d love to meet even more AIs in this series…though Murderbot’s interactions with humans are as brilliant as always. And the praises keep on rolling in! I personally stand in the middle. I didn’t really care for All Systems Red, I found it fine but not mindblowing by any means. The characters were quite charming and overall, I liked it while reading but I found the first novella forgettable. I will probably give the second one a try to see if I still feel the same but I have lowered my expectations! Indeed, I hope she’ll expand things as much in the next one. People keep saying I should read Murderbot. Mostly they say that Murderbot reminds them of me. Not sure how to feel about that lol. I adored Murderbot!! I want a tank shirt with “I heart Murderbot” on it and a cool logo. I may have said this once or twice before. Yer review makes me excited all over again. I want the next book. Arrr!!! She’s got her Raksura series and a couple other books here and there including media tie-ins. I’m loving Murderbot more than any of those so far though! This series sounds really cool…and cute? I don’t why, but your description of Murderbot enjoying entertainment feeds and having a heartwarming relationship with another AI reminds me of WALL-E for some reason. 😂 Awesome review! You make this novella sound so quirky and compelling! I definitely have to read these – Murderbot sounds great. Oh you’ll definitely love these, Lynn! I am curious about the relationship between the AI and Murderbot so I will probably give it a try even if I found the first story a bit forgettable. Hopefully you’ll find this one more to your liking! I wouldn’t call it earthshattering, but it does add a bit more to Murderbot’s history and personality!